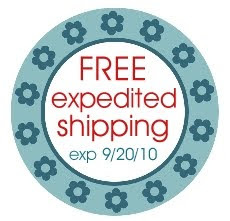 Craftin' Caro: FREE SHIPPING BIRTHDAY SPECIAL! All Canadian Stampin' Up! orders placed with me from now until midnight Monday September 20th will qualify not only for my free shipping special, but also EXPEDITED SHIPPING through FedEx, which means you'll be getting spoiled with super fast delivery. You'll also receive my 22 page September tutorial for the Just Believe Stationary Kit! You can place your order in person, by email or just drop me a line. If you prefer to place your order online, I'll simply refund the shipping costs via e-payment or personal cheque, your choice. Please note: Orders over $65 can ship direct to you, under $65 will be sent to my studio for local pick-up. Don't forget that there's still time to join in my Birthday Card Contest. I've received some gorgeous cards already and look forward to featuring them here on the blog between Sept 14 and 19, while I'm away at Founders Circle! P.S. On a personal note, I want to thank everyone who sent us good wishes and prayed for the safe return our our beloved snake Patty. Our silly little corn snake had escaped her vivarium by squeezing out through a weak link in the mesh top over a week ago and we tore our home apart looking for her. She was eventually found 2 nights ago when Brent was reaching into the washing machine to move the clothes into the dryer. He spotted something moving between the drum and the side of the machine and yelled in surprise. She'd obviously crawled up from UNDER the machine...luckily she wasn't actually being washed with the clothes - LOL! It was just nice and warm under there. We are SO happy she's safe and fine!!!!!! !